Where the electrical cable will be visible, we use a flex that matches your chosen finish, is sympathetic to the design of the fixture and meets your electrification requirements; please see the table at the bottom of the page for details. Table, Desk and Floor Lamps are provided with 2 meters / 80” of flex with switches placed 30cm/ 12” from the Lamp base unless specified otherwise. Upon request most table lamps for use in the UK, or US can have a switch on the lamp-holder in addition, or instead of, a switch on the flex. Table Lamps for use in the UK are provided with a 13-amp plug (with 3-amp fuse) unless specified otherwise. 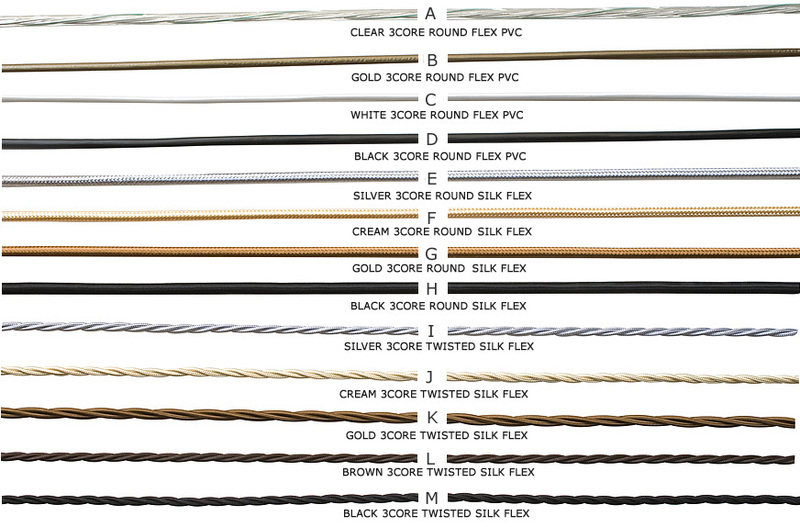 We use the most discreet match of flex, switch and plug to your chosen finish. Please see table below. Hanging Lights are wired with an additional 1meter /40" of flex longer than the length of chain /rod specified. You may specify a different flex, quantity of flex, plug or switch colour at time of order. *100-120V Hanging lights may also have separate nickel, or copper earth.